Rajeev is a highly engaging speaker and provides powerful insights on topics ranging from Personal Motivation and Leadership to Building Sustainable Growth Organizations. This session describes how the 21st century is totally different from the 20th, then debunks several myths about management and leadership at large corporations. It challenges 1) the over glorified democratic, all-inclusive leadership style, 2) the stretch goal based management philosophy, 3) the nine-box succession planning method; and presents bold new ideas to reincarnate leadership and management into a future-proof model. The audience will learn the counterintuitive wisdom behind autocratic vs. democratic leadership, crowdsourcing innovation, and minimizing supervision to maximize employee performance. Unlike their parents, millennials find themselves navigating their careers in unprecedented times: the world’s largest taxi company owns no cars and employs no drivers directly, the world’s largest hotel service owns no properties and employs no housekeeping or room service staff, communication has been whatsapped, memories instagrammed, and life itself facebooked. In the age of 24/7 connectivity of people and things, knowledge is free and abundant, everyone is empowered and life is totally transparent. Almost everything we knew as normal in both business and social life has changed dramatically just in the last 10 years. 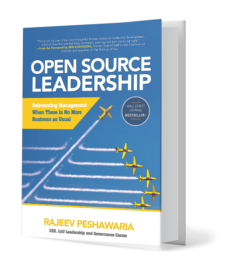 Rajeev explains how millennials can lead themselves and others effectively in the uber-connected 21st century – the open source era – where speed is everything, and competition more intense than ever before. Leadership is not a position or title—it’s a choice. Rather than competencies, personality assessments and best practices, this session challenges conventional notions about what it takes to be a powerful leader, asserting that it is deep intrinsic energy that drives the best leaders to keep going in the face of formidable resistance. After explaining the concept of leadership energy through vivid storytelling, this session provides practical guidance on how to uncover one’s own unique sources of long-lasting energy. Just as the human body needs all three systems—the brain, bones, and nerves—functioning in perfect harmony to maximize longevity and performance, a business needs its strategy (brain), architecture (bones), and culture (nerves) functioning in harmony to maximize results. By controlling and shaping the three most important pillars of sustainable business growth, this session shows how senior leadership teams can assess their own effectiveness in leading growth, and use proven tools and frameworks to take corrective action. As an enterprise leader, you should focus on these three as your most important focus areas; everything else must be delegated. That a greater representation of women in an organization broadens the range of perspectives in the decision-making process, stimulates critical thinking and creativity, and heightens business results and profitability, is no longer breaking news. Though the advancement of women has been a focus of many corporations for over 25 years, women continue to be under-represented within top management ranks, and while the numbers may have crept upward, they are still staggeringly low. This is despite the fact that organizations have long been using a cocktail of initiatives including legislated quotas, work flexibility, better onsite childcare, female advocacy and empowerment groups, and greater support from the top. Not discounting the importance of these policies, this session asserts that the answers lie less in organizational culture and more within the women themselves — their emotional integrity, the courage to accept and acknowledge what one really wants for oneself and why. It also argues that if they decide to, women often make better leaders than men. See an article about this talk here: The Key to Closing the Gender Diversity Gap. Even though these five principles are proven keys to success, happiness, and leadership, when faced with situations that most need their application, the human brain goes into denial and we do the exact opposite. This session shows how to avoid the common denial traps. See a video teaser of this talk here: 5 Denials of the Human Brain. Why do some people manage to stay in the game and win despite the toughest of resistance, challenges, and obstacles when most others give up? Why does growth stall at mid-career level for so many people even though they may have earned stellar performance reviews until then? Why do some people manage to achieve their stated career goals and experience real happiness at the same time even while most others do not? And why do some people manage to balance work and life seamlessly even though the demands on them at work and at home are anything but trivial? This session, based on years of research in international markets, will uncover the core of what it takes to not only take charge of your own career, but to thrive in hopeless environments where conventional wisdom would recommend giving up and moving on.